This month, Venice turns 111. In spite of her age, she’s looking hot. Yes, she has a case of melanoma, or is it just zits? In any case, those Big Box pimples can’t ruin her long-time charm and beauty. Recently supporters of these BB monstrosities won the Little League Neighborhood Council majority and, with it, the right to “advise” their betters at City Hall. But with Venice, it ain’t over, until it’s over. It’s true an infusion of wealth has come to Venice, distorting the lay of the land. Oddly, all that money being raked in by soware companies residing in Venice hasn’t diminished the number of homeless people on our streets. Nor has it contributed to the beauty of Venice. Some longtime supporters of cityhood lately have told me that they are now fearful of being overwhelmed by the swarm of people in Venice who, if not truly wealthy, are at least rich. Fear not, ye wretched of the earth. Don’t underestimate our situation. Wait until Venice works her wiles on unsuspecting newcomers. Soon, they will be defending the hallowed streets of Venice, and quoting Land Use provisions on setback and fence height. And even the most incorrigible and dogmatic developers and their kin may end up taking shelter under the big tent of cityhood. The fight for cityhood in Venice has always been a multi-class affair. e desire for self-determination and democracy has never been an issue just for the downtrodden. In fact, the founders of this country, whose birthday we also celebrate in July, included wealthy slave owners, cultured Bostonian merchants and Philadelphia industrialists. In addition, yeoman farmers flocked to the cause and did the actual fighting. Women kept the home fires burning, while slaves and Native Americans probably would have been better off had the British won. Although Venice is a city, not a country, the same conditions mostly apply. Foremost is the right of self-determination, which is acknowledged as an international legal principle. Venetians have shown in poll after poll that if they were allowed self-determination, they would vote for a return of their cityhood which was taken from us in 1925 under fraudulent means by an expansionist Los Angeles. The law was changed after Venice was absorbed, making it more difficult to exit than to enter. 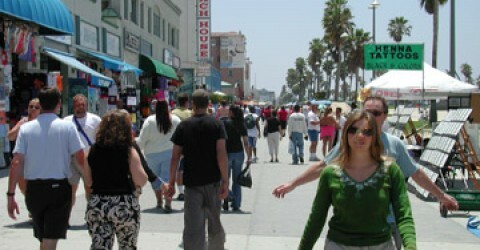 e most undemocratic provision was a new requirement that to leave, Venice would need an affirmative vote from the entire city of Los Angeles. Since Venice’s population is about 1 percent that of the megalopolis, this is nearly impossible to accomplish. Venice simply doesn’t have the resources that the moguls of L.A. could muster to run an untruthful campaign designed to smash a yes vote in the rest of the city. Not even the San Fernando Valley had the resources to counter the constant tales of woe and disaster that would befall every family in Los Angeles if the Valley or Hollywood could make good their bid to escape. Still, voters living in the Valley did vote for cityhood. A lot has changed since that attempted prison break in 2002. For one, working-class Brits, fed up with economic austerity and more and more wealth accruing to upper-class twits in London and Brussels, struck out into an unknown future. ey overcame a hostile campaign in which those for Brexit were called right-wingers, regardless of where they stood on the political spectrum. ey were called anti-immigrant even though the current government has shut its doors to thousands of refugees just across the channel in Calais, and they have even banned Afghan interpreters who worked for British troops from having safe haven in England. The winds of self-determination are blowing around the world. Our own namesake, Venezia, recently voted in favor of leaving Italy and restoring the Republic of Venice more than 200 years aer their independence was taken from them by Napoleon. Catalonia, including Barcelona, has a powerful movement to restore its country which is now part of Spain. Scotland is now demanding a referendum for independence from Britain, and there are calls for the reunification of Ireland. Our little Venice is scarcely more than a mile square with about 40,000 people, yet is more populous than about 45 of the 88 cities in Los Angeles County. Because of soaring property values and many thousands of tourists, Venice is well equipped to maintain a city government designed by and run by its people, no matter how much they disagree with each other. Our grievances against our L.A. rules are too many to enumerate in short article. Suffice it to say that City Hall has never cared for Venice. ey hate our independent ways, our love of art, and sand and sea. ey hate the beauty of our beloved city, and the best among them are ashamed of how they’ve treated her. So how can win back our city while enjoying every minute of it? 1. Circulate a petition for cityhood. It doesn’t have to be official. Let’s judge the sentiments of our neighbors and find others who will help. A few years ago, Dr. John Michel, a kindly homeless man, went everywhere with a Venice cityhood petition. He collected thousands of signatures. Unfortunately, when he died in 2010 no one picked up his pencil and clipboard and carried on. 2. Let’s change the law. It should be our decision as Venetians whether we remain or exit. Let’s go to the legislature (where L.A. is not very popular) and change the law. Let’s explore the possibility of a lawsuit to remove the provision that all of L.A. must vote. 3. Let’s circulate an official petition for cityhood with as many Venetians as possible doing the circulating, and signing. 4. We’ll have to prove that we can afford to be a city. We’ll have to decide if we are going to contract for police and fire, and other services. We’ll have to cost out the alternatives. We will have to make decisions for ourselves! 5. Let’s win our election in a Venice Tsunami.